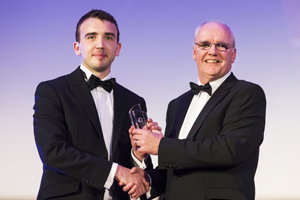 James Truesdale, who graduated with a MEng degree in Chemical Engineering in June 2012, has won the AWE Award for the Best Chemical Engineering Student at the 2012 SET Awards. James won the award for his industrial project on “Application of lean manufacturing techniques to whisky production” which he did with Diageo at their Cameronbridge site. The objective of James’ project was to study, identify, and implement methods for process optimisation across the continuous whisky production process making best use of all available resources. The project had several key targets aiming to “squeeze more volume from the same equipment, spend less money while doing so and also to operate in the safest and most environmentally sustainable fashion possible”. The SET Awards (Science, Engineering & Technology Student of the Year) are Europe's most important awards for science and technology undergraduates and provide a showcase for educational excellence by publicly recognising the exceptional achievements of both students and universities. Over 500 nominations were received in 14 categories and the award was presented at a ceremony on the 26th of September 2012 in Kensington Town Hall. James, who is now working for BP, has also won a prestigious Salters' Graduate Prize which is recognising first class graduates who show the potential to be future leaders in the UK chemical and allied industries.